The planet’s oceans are under severe threat from climate change which has recently been identified as the single most palpable threat to all marine ecosystems. The impact of climate change on global coral reefs has been devastating, threatening the livelihoods of millions of people including coastal communities within Eastern Africa and the islands of the Western Indian Ocean. Over the past two decades, coral reefs within the region have suffered widespread degradation through a series of ocean warming events and subsequent coral bleaching. This resulted in an average loss of 90 % live coral cover in 1998 and a further 50 % loss in 2016. In addition to coral mortality, coral bleaching inhibits overall reef health and resilience capacity, coral reproduction and increases disease prevalence. Motivated by slow post-bleaching recovery rates, the ‘Reef Rescuers’ project was developed to restore the fringing coral reef within Cousin Island Special Reserve. The first ever large-scale reef restoration project began in 2010 with the financial support of United States Agency for International Development (USAID). 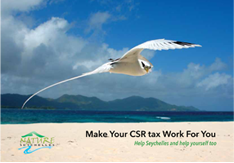 Further financial support was received under the Government of Seychelles-Global Environment Facility (GEF)-United Nations Dvelopment Project (UNDP) Protected Area Project in 2011. Utilising the ‘coral gardening’ concept, fragments of healthy coral were collected, raised in underwater nurseries and then transplanted onto a degraded reef. Since 2010, 40,000 corals have been raised in underwater nurseries, of which over 24,000 were successfully transplanted, covering the area of a football field (5,225 m2). The long-term success of the project is currently being assessed, with initial data demonstrating an increase in both coral recruit and fish densities following intervention, highlighting the benefits of active reef restoration. The project has already had a very positive knowledge-building impact, with over 40 scientific divers and volunteers trained on reef restoration techniques and the first ever Reef Rescuers Training program delivered in 2015, with six multinational trainees successfully completing the eight-week training program. To further disseminate knowledge gained from the ongoing Reef Rescuers project, a ‘Reef Restoration Toolkit’ is has been published, highlighting lessons learned and restoration best practices.